In my previous post I mentioned a couple of negative reactions to the local beer by visitors in Stuttgart in the later 1800s. Curious about how breweries operated there, a little investigation produced an interesting account of a brewery called Denninger. The period is somewhat earlier, 1848 specifically. The source is a French book that studied agriculture and education in Germany, in part to suggest markets for French agriculture exports: the book was published by the French Ministry of Agriculture. French wine’s potential as an export to Germany is raised more than once. 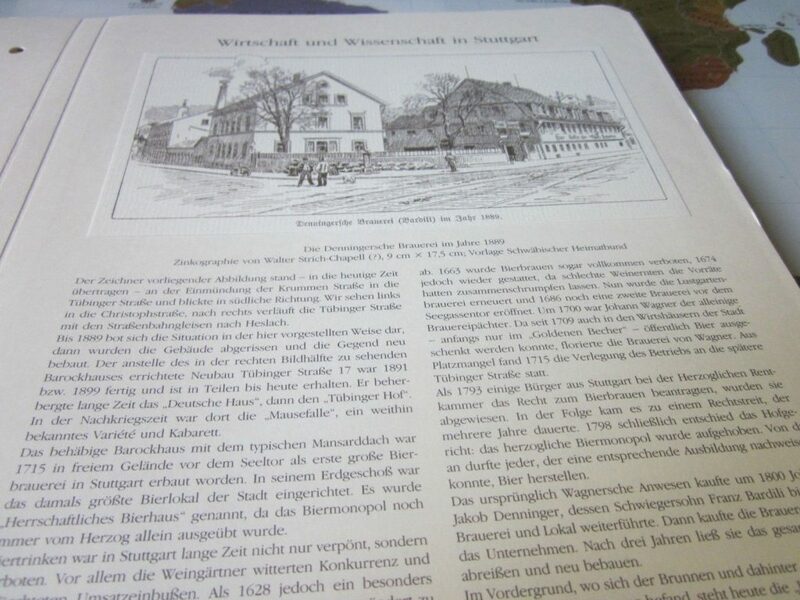 A multi-page portrait of Denninger brewery in Stuttgart reveals many points, down to the quantities of malt and hops used and types of beer made. Denninger was the largest brewer in Stuttgart, one of 22 serving 48,000 people, but representing one-third of production. It is noted Denninger was an Alsatian implant – a French eye would have noticed that at a time Alsace was under French dominion. Although the author of the book doesn’t say, Denninger, whose full name was I believe Jacob Denninger, was Jewish, one of the few Jews to own a brewery in Germany. His Jewish background was mentioned in one of the German historian Heinrich von Treitschke’s books, here (not a great source considering his well-known anti-Semitic posturing, but sources must be taken where found). Treitschke also noted Denninger was from Strasbourg. There is no suggestion in the French study that Denninger’s beer was lacking in any way, to the contrary. Still, and broadly speaking, if Denninger made beer as brewed in 1800s Alsace perhaps it was lesser to the best productions of Bavaria. Numerous period accounts attest to the general superiority of German beer to Alsace beer, in other words. Be that as it may, Denninger brewed two types of beer – a brown winter beer and a summer white beer. I believe the brown beer was a Munich-type as its brewing in the cold months of January and February is stressed. There is mention too of some use of chilling equipment, this was probably for fermentation. March was mentioned as too warm to brew safely. Also, the author insists on the modernity of the plant and installations and that the beer brewed in winter was long preserved in Denninger’s cold cellars even if not particularly strong. All this suggests lager brewing at least for the winter beer, imo. German-language sources such as this one give more information on Denninger’s brewing but I was unable to follow it clearly enough to comment. Denninger died in about 1870, and the brewery’s fate after is a question mark for me although as noted above it seemed still in business c.1890. The French book describes Denninger as serious in personality but known for philanthropy and generosity in the community. Due to the importance of beer and malt levies to the Wurttemberg treasury the book expressed doubt that French wine would be given much chance to penetrate. That is, the regional government would do nothing to help French exports if tax revenue was reduced due to a lowered consumption of beer. Presumably any duties and charges on wine imports would not have made up for the anticipated loss from beer sales. My guess is that after 1850, as the Munich breweries in particular ramped up in size and efficiency, shipments to Wurttemberg, which lies west and to the north of Bavaria, increasingly took market share from local brewers including in Stuttgart, the main city. As to subsequent lore that imports from Bavaria and Pilsen were superior, it’s an old story that the very fact of importation confers cachet. Perhaps Denninger’s best was as good as Munich’s but without the aura of import, it was viewed as second class. But still good enough for the burgher’s faucet! Today, Stuttgart brews some respectable beer, Dinkelacker is based there. It was a noted import to the U.S. in the 1970s. Drink the Dink, was the slogan. By the end of the 1800s, Wikipedia tells us Dinkelacker was the largest brewer in Stuttgart. No doubt it was one of the duopoly that piped beer direct to consumers’ homes. Carl Dinkelacker started the buisness in 1888. As it seems Denninger was still operating in 1889 perhaps it and Dinkelacker were the two promoters of the beer-piping scheme. Note re image: Above image is from a German e-bay listing, here. All intellectual property therein belongs solely to the lawful owner, as applicable. Used for educational and historical purposes. All feedback welcomed.